Newmont Mining has agreed to buy a mine from a competitor; is this the right time to make that move? Newmont Mining has agreed to purchase the Cripple Creek & Victor gold mine in Colorado from competitor AngloGold Ashanti Ltd for $820 million in cash. From a production point of view, it looks like a good deal. For example, it will add "between 350,000 and 400,000 ounces of gold per year in 2016 and 2017 at all-in sustaining costs of between $825 and $875 per ounce," according to Newmont's news release announcing the deal. That means the mine will make money even at today's relatively low gold prices. 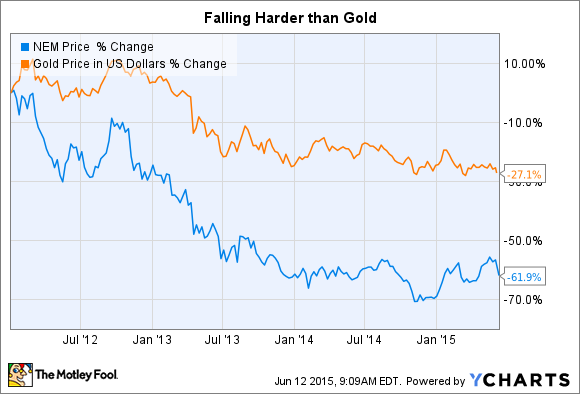 The problem here is that Newmont, like its competitors, has been dealing with a tough gold market. For example, revenues have fallen roughly 30% since 2011. In fact, Newmont itself has been selling assets to raise cash so it can fund capital expenditures and pay down debt. And like competitors throughout the mining industry, it's pulled back hard on spending, with investments in property and equipment last year coming in at roughly a third of the level seen at the recent peak in 2012. That said, if a good deal comes around, you have to bite, or you'll miss it. And this looks like it could be just such a situation. But what's the cost? The mine is being purchased for $820 million in cash. At the end of the first quarter, Newmont had more than enough cash to pull that off. However, it decided to issue 29 million shares, for net proceeds of $682 million to help pay for the deal, increasing the number of shares over which earnings have to be spread. That works out to around $24 a share (assuming banking costs rounded the actual cash raised through the deal to $700 million). Unfortunately for shareholders, that was below the price the stock was trading at. Newmont stock has since fallen from nearly $26 a share before the share issuance announcement to a touch below $24. And if that isn't bad enough, don't forget that Newmont shares are down around 60% since peaking in late 2011, so the gold miner was already using depreciated currency. The cost of those shares isn't a one-time event, either. Newmont is currently paying a quarterly dividend of $0.025 a share. That doesn't sound like much, but the additional shares will add nearly $3 million to the company's annual dividend expense. As an investor, there's good reason to be leery of this deal's actual costs. These are hard times in the gold market. On one hand, Newmont was able to pick up an asset that looks like it will be a good addition to its portfolio. On the other hand, it's financing the deal with stock at what can only be described as a bad time. It can handle the deal, but it looks like shareholders are the ones picking up the biggest piece of the tab.